Sometimes you need to access your database directly and to do that, you need to use phpMyAdmin. The phpMyAdmin handles the administration of your MySQL Databases. You can have multiple databases for one domain name, so phpMyadmin stores all these databases that are linked to a domain. Access to your phpMyAdmin is extremely dangerous. You must know what you are doing when you enter in to the phpMyAdmin. Any wrong change in your database can cause extreme effects on your website, it might even bring it down. So be careful whenever you access and make changes your database. 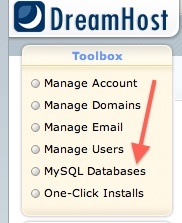 Login to your Dreamhost account and along the left navigation, under Toolbar, you will see a link for MySQL Databases. You will see a list of databases you created for your domain. If you have more than one domain, you will see many databases listed here. You can also create many databases under one domain, so you will see all the databases listed here as well. Each database name is unique. 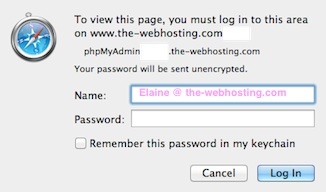 Another small window will popup to allow you to enter your phpMyAdmin username and password. If your forgot your phpMyAdmin password, you can find my tutorial here to help you change it.